A friend posted this vintage pic of me to Facebook last year. There are more recent days that I can’t remember, but this moment is pretty clear. This was during my junior year of college. My sorority was hosting a fundraiser, and my BFF and I were co-chairs. The tuxedo shirt was the evening’s uniform. A Soror snapped this pic while we were setting up. That event (DST King of Hearts Pageant) was the first event I’d ever planned. There were so many moving parts, and I was a bundle of nerves. One of the contestants was driving me batty, and I remember screaming at him at some point. There were a few other hiccups, but overall, the evening went well. I didn’t appreciate this photo until I ran across it a couple of weeks ago. 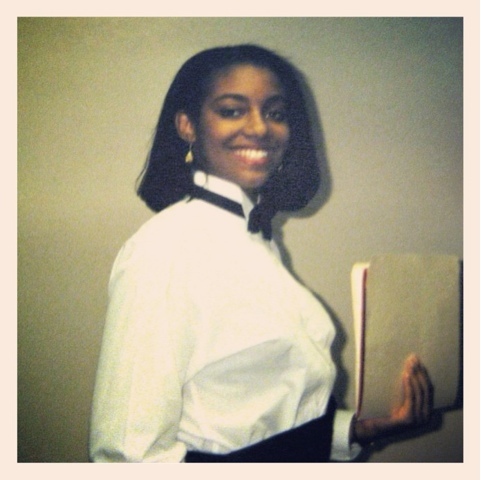 I make my living as a project manager and event planner, so this pic is a glimpse of how I started. One thing I wish I had known then is that the unexpected will always happen, no matter how well you plan. What makes the difference is how you navigate the bumps along the way. Keep a cool head, a calm demeanor, and treat your team with respect. Oh, and wear comfortable shoes. I had on heels that night. My feet were killing me by the time I got home. It’s so important to look back sometimes in order to put things in perspective! Congrats on your writing! I am doing the same on my blog. I like fashion, but writing is my passion. I agree. Thanks for stopping by Tia! I saw that you planned weddings! Sounds fun (and challenging)! This throwback wasn't so bad, but some of them are killers, LOL! Yes, I often say that I became the real me by working in Delta. I learned so much about myself and how to work with others. Shoot, I feel another post coming on! HA! No problem. I appreciate you stopping by!